This one is tough for me, and should be tough for everyone, since we are in an era where defense is so overlooked in the NBA (Don’t try to say it’s not. Teams are scoring 120+ a game these days). Somehow Rudy Gobert’s defense has been good enough to slow down the elite offenses we see today. Gobert’s ability to defend strong centers AND athletic stretch forwards makes him deserving of this award. Oh, and don’t forget – the numbers don’t lie and the man averaged 2.3 blocks per game. 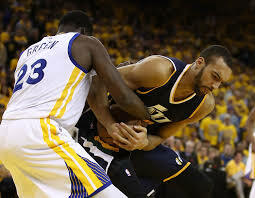 He was undoubtedly the difference maker for the Jazz this season, leading the team to being the second best defensive rated team in the NBA (behind my Boston Celtics). He was even able to bring the Jazz back to the playoffs even after losing Gordon Hayward in the offseason. I understand he missed time, playing in only 56 games this season, but the presence he had on the floor when he was playing was undeniably powerful. This award is a lock for Gobert. Previous Who’s to Blame for the Cowboys’ Failures? Is the AFC’s best team being overlooked? Doncic is a great rookie, but will he get any better?